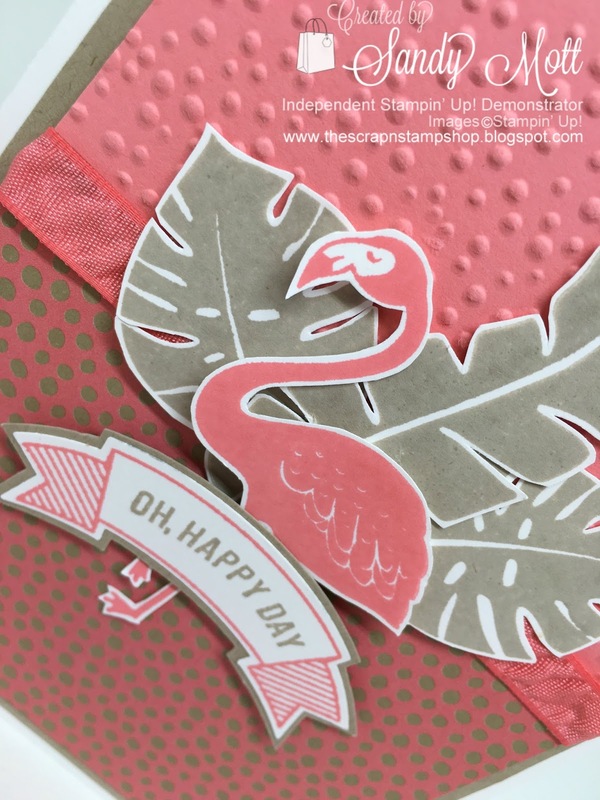 I'm loving this Flamingo in the new "Pop of Paradise" stamp set. I stamped it in our new in-color, appropriately named Flirty Flamingo. This stamp set was another "must have" on my list, especially with summer here and my thoughts always gravitating to Florida. I used Crumb Cake with Flirty Flaming and Whisper White for the card. The designer series paper is called "Affectionately Yours". I chose to do the leaves in Crumb Cake to match my color scheme. 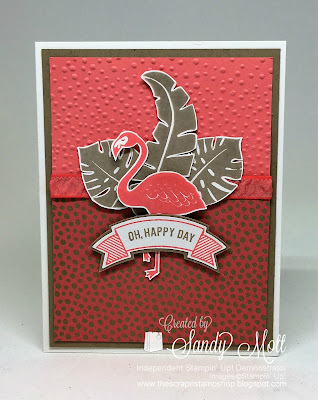 I loved how the Softly Falling embossing folder complimented the paper. 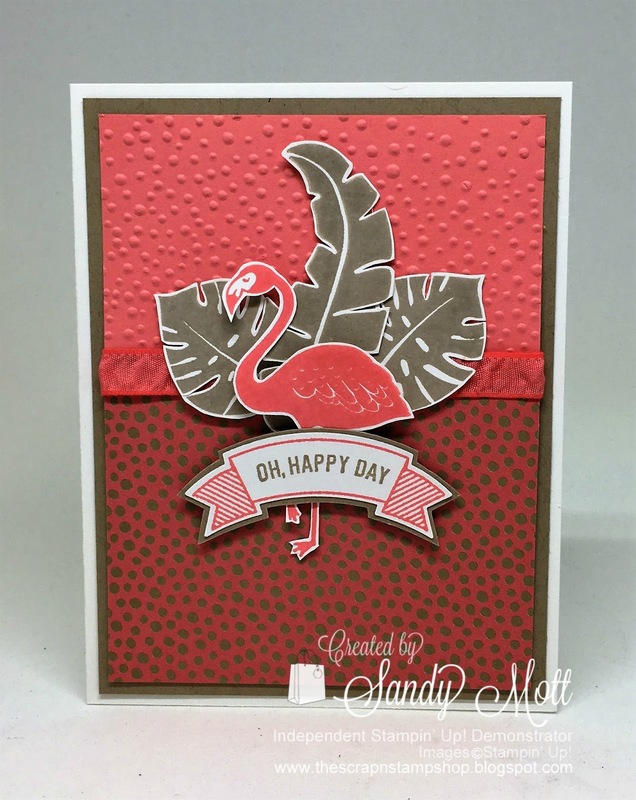 I also added the new Ruched Ribbon in Flirty Flamingo. I used the new "Thoughtful Banners" stamp set and coordinating punch (available in a bundle) for the sentiment. The sentiment is backed with Crumb Cake cardstock. I hope you enjoyed my card today - I would love to hear from you. 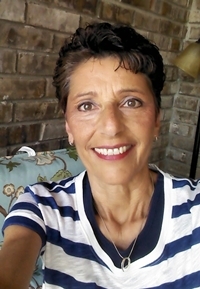 JOIN MY TEAM IN JUNE! For the month of June, you will get over $200 worth of Stampin’ Up! products of your choice for $99! Oh, yes!! Attend my classes for FREE. 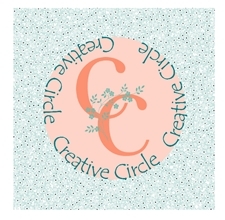 Unlimited access to ME for creativity, advice, sharing, and FUN. Click on the JOIN MY TEAM tab above to take advantage of this great offer!